PDF/A-1b standard for PDF file ensure its content look same when accessed anytime in future. You can validate and check any PDF document file for compliance with the PDF/A standard. 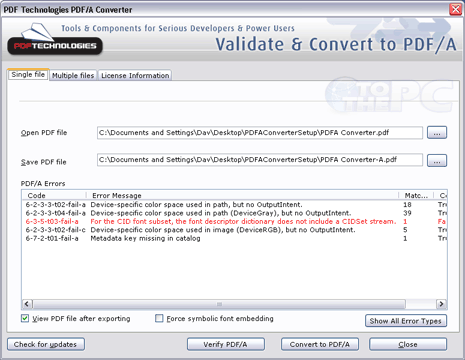 PDF/A converter is a free tool for such validation and conversion of PDF file to PDF/A standard. It checks for conditions that prevent a document from being PDF/A compliant and attempts to correct them by converting it to PDF/A-1b standard. 1. Download Free PDF/A converter & install it on the computer. 2. Launch the converter program & select any PDF file. 3. Click ‘Verify PDF/A’ button to check for errors or conditions preventing file for becoming PDF/A-1b standard complaint. 4. Click ‘convert to PDF/A’ button to convert file into PDF/A format in single click. You can view detailed error report while converting PDF to PDF/A standard. For sure one simple tool for PDF validation.